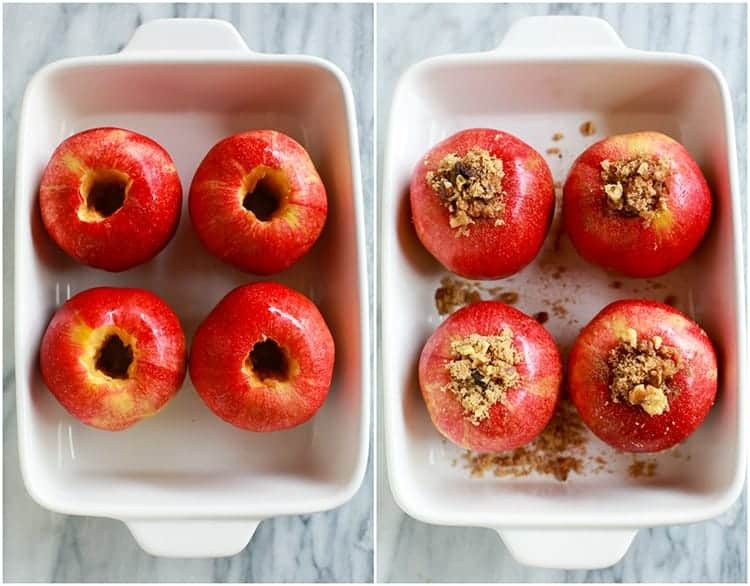 These easy Baked Apples are a delicious healthy fall dessert. 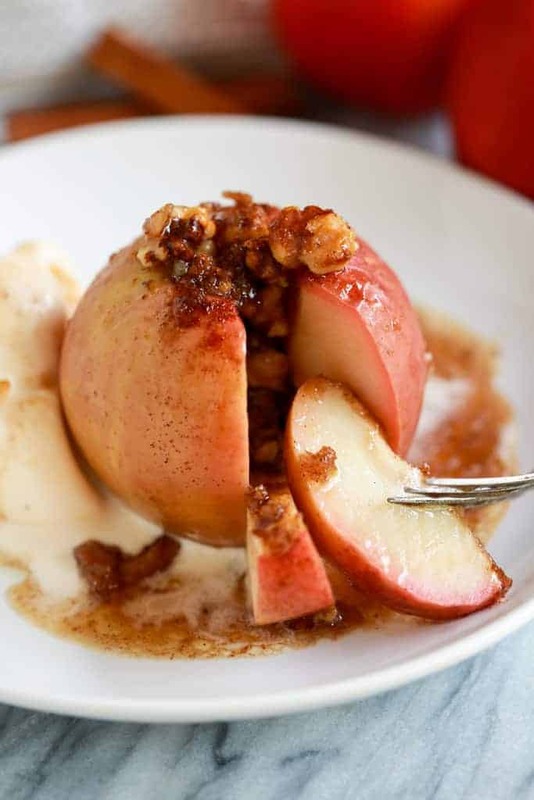 Crisp fresh apples stuffed with a cinnamon sugar, walnut mixture and baked until warm and tender. Serve with a scoop of vanilla ice cream. Hooray for apple season! I have so many favorite apple recipe this time of year, It would be hard to choose a favorite! Top contenders are my Grandma’s apple cake, and the most popular apple crisp. What I love about baked apples is you still get the sweet tooth fix, without all of the extra calories. My love for this healthy treat comes from my Mom. Whenever we had a big sweet tooth, but didn’t want a heavy dessert she would make baked apples. They take all of 5 minutes to prepare and the end result is sweet, tender apples with a delicious sweet filling. I love to top mine with low fat vanilla ice cream and a little drizzle of my favorite homemade caramel sauce. It’s perfection. Use a pairing knife to cut a deep hole into the apples, removing the core; this is where the filling will go. Combine brown sugar, butter, cinnamon, and nuts and fill the apples with this mixture. Pour about 1/4 cup of water in a baking dish, place the apples on top. Bake for about 40 minutes, or until they are tender when poked with a fork. When serving baked apples I like to scoop the juices from the bottom of the pan on top of the apples. Yum! Granny Smith apples are my favorite for any kind of baking, especially in dessert recipes like apple crisp, or Apple Cake where the apple is really the star of the show. 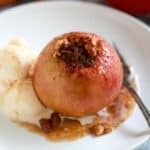 For this recipe, I love to use large red apples, but you can really use any type of apple. 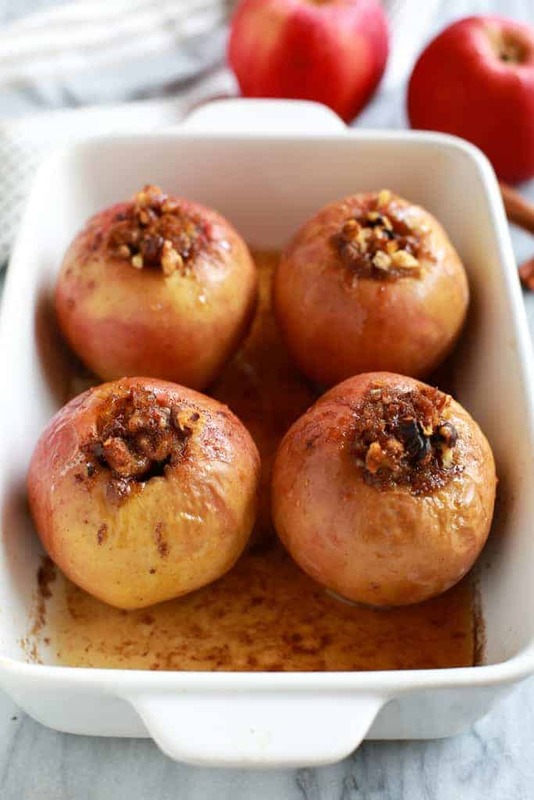 Crisp fresh apples stuffed with a brown sugar, pecan mixture and baked until tender. One of my favorite healthy treats! 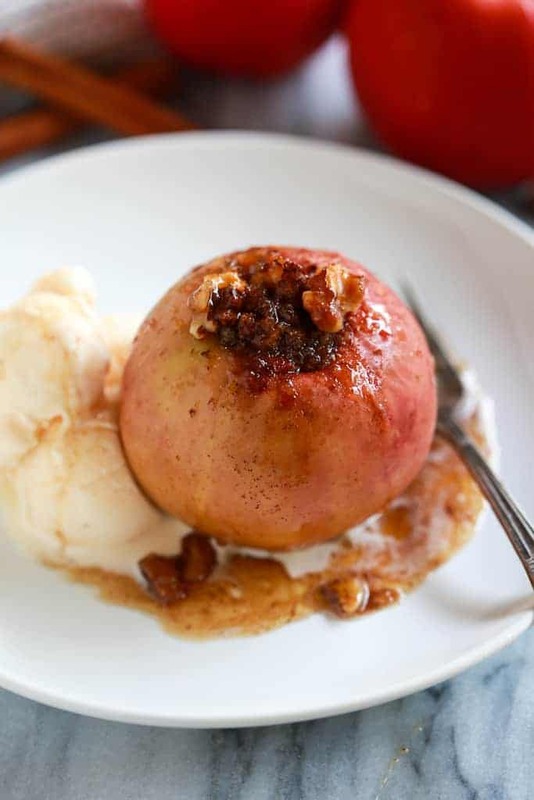 Preheat oven to 350 degrees F. Use a paring knife or apple corer to remove the stem and seeds from the apples, making a deep hole where the filling will go. Combine the brown sugar, butter and cinnamon in a small bowl and mix well to combine. Add the nuts. Spoon mixture evenly into each of the apples. Add 1/4 cup of water to a baking dish and place apples on top. Bake for about 40-45 minutes, or until apples are tender when pierced with a fork. Remove from oven and allow to cool for a few minutes. Spoon the sauce drippings from the pan over the apples. Serve with ice cream, if desired. *I originally shared this recipe in September 2015. Updated October 2018. Delicious recipe, easy, simple, common items that you may have already. We used red delicious apples, we didn’t have nuts on hand so we used dried cherries, they came out perfect. Thank you for sharing this recipe which will now be a dessert staple in our home. Perfect dessert for 2. 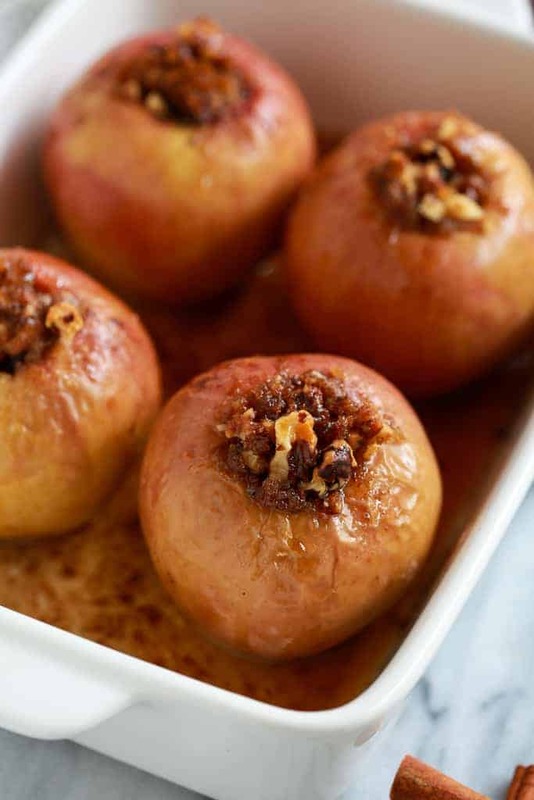 Our empty nest loves these baked apples for a warm dessert that’s not too sweet. Delicious!